Once your audio is sliced, you can adjust volume, pan and attack/decay on a per-slice basis for playback. Slicing audio samples based upon transient detection is a well-established technology, so you might be forgiven for not sitting up straight and paying attention to ReSlice. This is the latest iOS offering from long-standing desktop music software developers VirSyn, who have fully embraced the iOS platform. Yes, it does do audio sample slicing based upon transient detection, but it’s what the app then allows you to do with those slices that is just a bit special. 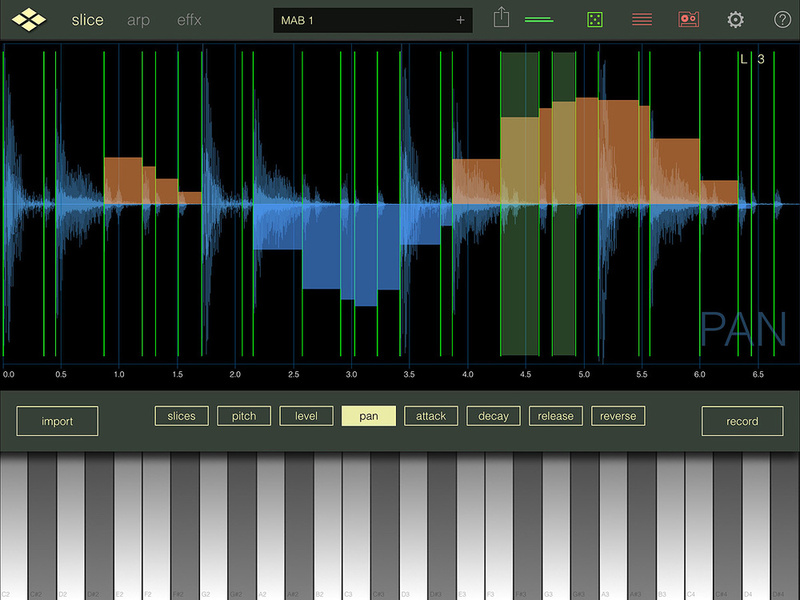 ReSlice is a universal app that offers support for Audiobus, IAA, CoreMIDI, Ableton Link, MIDI Learn and — hooray! — iOS Audio Units. The app ships with some example audio files included but you can import your own audio via various routes and also record audio directly into the app. Whatever route you choose, once the audio is loaded, ReSlice does the usual slicer thing and divides the audio into separate audio slices (up to a maximum of 32), and then maps these across consecutive MIDI keys for playback. You can, of course, edit, delete or create slices via the waveform display. Equally, you can adjust the volume, pan and attack/release on a per-slice basis. So far, so good. This works well, allows you to play individual slices back via MIDI and offers both MIDI and audio export options if you want to take your sliced audio elsewhere (perhaps to a sampler/drum app) or trigger it from a sequencer. However, VirSyn have added two very interesting further twists that up the ante considerably in creative terms. 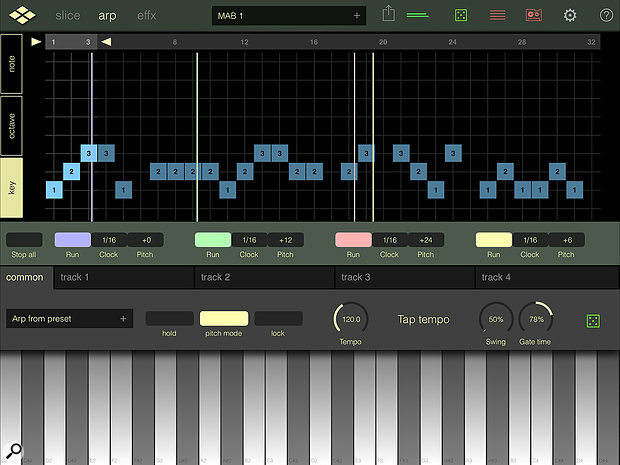 First, they have added a fully featured arpeggiator/step-based sequencer. This allows you create patterns up to 32 steps in length and create custom arpeggiator patterns where you can set note, octave and key settings per-step and these all interact with whatever MIDI notes (slices) you happen to be holding down as the arpeggiator runs. The result can be utterly fabulous rhythmic patterns based upon your slices, and you can change the sounds within that pattern simply by selecting different MIDI notes (slices). The arpeggiator/step-based pattern sequencer, with its four separate playback heads, can create rhythmic magic even from the most mundane of original audio sources. That might be enough for many users, but the second twist is that the arpeggiator actually has up to four playheads. You can run as many of these as you like at the same time and, rather wonderfully, while they run through the same underlying arpeggiator pattern, you can set the start/end points (and hence the number of steps) individually and also adjust their relative tempos. Polyrhythmic audio slice-based parts anyone? This is super-cool and very creative. Oh, and there is a full effects section thrown in for good measure to top it all off. ReSlice is great on iOS but I also sincerely hope VirSyn port it to Windows/Mac OS. I’d be there in a flash and this is another example of an iOS music app that could easily find an audience on the desktop. ReSlice is an absolute blast and if you like to squeeze every drop of musical life out of even the most humble of audio samples, this is an app well worth trying.